Summer is coming here in the Northern Hemisphere. Depending on where you are, you may already be sweltering, or you may just be happy that the snow has melted. Either way, it’s getting warmer and we need to adjust our habits for that, in order to thrive. Living in rhythm with the seasons didn’t used to be optional. We ate nature’s bounty and spent more time outdoors in the summer. We ate root vegetables and other stored food in the winter. By the time spring rolled around, we were close to out of food, so we naturally fasted and cleansed before the spicy, bitter greens of spring poked through the ground. Now we can eat a watermelon in January. We can get blueberries from Chile when there’s a foot of snow outside our door. We’ve got all the food we want all year long. That’s great. Or is it? Living out of sync with nature is one of the main causes of dis-ease in modern society. The more we line up with what Mother Nature is doing, the better. So, what should we be doing in summer to maintain vibrant health? Stay Cool. Duh, right? But, many of us unknowingly do the opposite. So, here are some tips to keep you cool and thriving. Exercise in the morning if possible. Evening is the next choice. Mid-day is not a good choice. Don’t go for a run in the hot sun on your lunch break, or you’ll find yourself crabby and aggravated all afternoon. Eat cooling foods. Juicy fruits and vegetables like melons, cucumbers, mint, peaches. Use spices and herbs like cilantro and fennel seeds. Minimize meat, grains and beans, as all are heating. Love ice cream? You’re in luck. This is the time of year to enjoy it! (not every day, of course). Limit alcohol. Many people drink more in the summer. Barbecues, picnics and parties are opportunities to over-consume. Alcohol is very heating. Keep it to a minimum or take a break from it altogether in the summer. Chillax. Summer is the time to slow things down and have some fun. Take a vacation, go for a swim, read a good book. Slow your pace as much as you are able. Hang out with the moon. The moon has a naturally cooling energy. Sit outside in the evening and moon-bathe to cool off after a hot day. Use cooling oils and rosewater. Spritz rosewater all over yourself. Use coconut oil for your moisturizer. Cooling essential oils include rose, lavender and jasmine; put a few drops of any of these into some coconut oil and rub on your feet before bed. Or, a put few drops in a cool foot bath and soak. 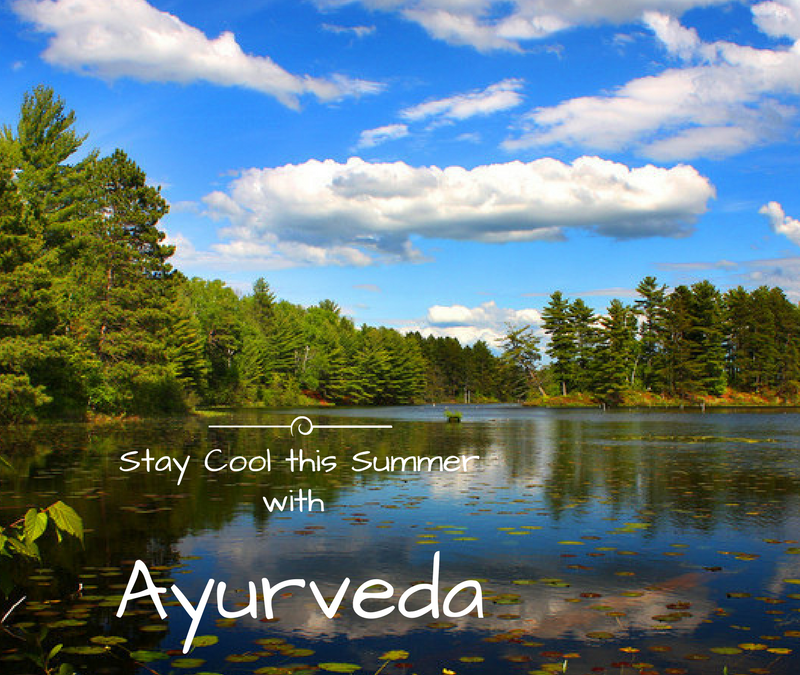 Follow these tips from the science of Ayurveda, and you won’t get all hot and bothered this summer.